The garden pea (Pisum sativum) is a hardy, cool-season annual. It is quite variable in size, ranging from 1 to 6 feet in height, since some varieties are dwarf, others half dwarf, and still others tall. It is cultivated in nearly all home gardens, in market and truck gardens, and is also grown on a very large scale for canning. Since it does not thrive during midsummer it is grown as a partial-season crop, i.e., in spring and early summer in the North and as a winter and spring crop in the South. Like other members of its family (Leguminosae), through the agency of bacteria in its root nodules, the pea is able to utilize nitrogen compounds which have been formed by using the free nitrogen of the soil air. Garden peas of a late or main-crop variety, known as Telephone, were planted Apr. 10. They were sown in rows 30 inches distant and the plants were later thinned to 8 inches apart in the row. Early Development.--The plants were excavated for the first time on May 23. They were 11 inches high and the stems 5 millimeters thick. Each plant had two or three branches and about a dozen large compound leaves some of which were not fully developed. The total leaf surface was 1.5 square feet. The plants had strong taproots about 4 millimeters in diameter at their origin. These tapered to 1 millimeter in thickness below the 9-inch level. Depths of penetration of 20 to 26 inches were found. The course of the roots was often somewhat tortuous. An examination of Fig. 51 shows that the bulk of the absorbing area was furnished by the numerous, strong, lateral branches nearly all of which arose from the taproot in the surface soil. Just below the seed, which was 1 inch deep, these occurred in great abundance. One rather large plant gave rise to 21 branches about 1 millimeter in diameter from the first inch; 14 nearly 1 millimeter thick from the second inch; 11 averaging ½ millimeter in diameter from the third inch; and 16 more, about 1/3 millimeter thick, in the next 6 inches. The specimen drawn had only about two-thirds as many roots. The general course of these roots was outward and only slightly downward. Thus nearly all ended in the first 6 to 9 inches of soil. A few of the longest extended laterally 15 to 18 inches and then turned downward. Depth of penetration, however, was not marked and only a few reached the 12- to 18-inch soil level. Hence, the plant had a rather superficial root system at this stage of growth. The absence of roots in the surface 1 to 2 inches of soil is of interest since it bears a direct relation to root injury by cultivation. Fig. 51.--Root system o f the Telephone garden pea 6 weeks old. As regards branching of the taproot, it may be noted that some of the laterals, even in the surface 6 inches, were only 3 to 9 inches long. Below this depth branching was much poorer as is clearly illustrated in the drawing. The length of the laterals decreased with depth of origin and the last 4 to 6 inches of the taproot were unbranched. This, of course, was also true of the major laterals. These were furnished with rootlets at the rate of two to eight per inch, distribution being somewhat variable. These sublaterals usually varied from 0.2 to 1 inch in length, although they were occasionally longer. They were rarely branched. Later Development.--A second examination was made June 17 when the peas were blossoming. There were about four branches per plant and these varied from 1 to 2.5 feet in length with an average length of 18 inches. Plants of average size possessed 45 leaves and a total leaf surface of slightly more than 5 square feet. The pronounced taproots had increased to 7 millimeters in diameter near the soil surface. They tapered to 1.5 millimeters at a depth of 1 foot but were nearly 1 millimeter thick throughout their sinuous course. Maximum depths of 36 to 38 inches were ascertained. Branching had increased to a marked degree; a few roots 0.5 to 1 inch long now occurred in the first inch of soil. Frequently as many as 100 laterals were found to originate from a taproot in the first 12 inches of soil. A maximum of 18 per inch was determined. These were 0.5 to 2.5 millimeters in diameter. In the second and third foot-portions of the taproot which were poorly branched at the previous examination-a total of 110 to 130 rather uniformly distributed laterals frequently arose. The branches become longer, in general, on the older portions of the taproots. Near the root ends no branching occurred. The lateral spread had increased only a few inches beyond that of the previous examination (now about 22 inches) but many of the widely spreading roots had turned downward and extended well into the second foot of soil. Moreover, the branching had progressed with the growth of the main laterals. Branches occurred at a somewhat variable rate, about seven per inch of lateral. This was also the usual rate of branching for the main laterals. Usually the branches were only 0.2 to 0.5 inch long although a few of them attained a length of 2 inches. Thus new soil areas were ramified for water and nutrients. A pronounced feature was the greater number of branches on the portions of the laterals at some distance from their origin. In fact the first few inches were often poorly branched. Branchlets of the third order were more pronounced than at the previous examination although on the newer growth only the longest secondary laterals were rebranched. No long laterals arose below the first foot of soil but the very abundant short ones (1 to 3 inches) added considerably to the absorbing area. In summarizing, four differences were apparent from the previous root development: The taproots had increased in depth from about 2 to 3 feet and the part below 10 inches had become clothed with a large number of short branches. 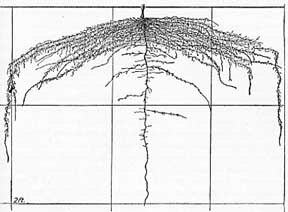 The number of lateral roots in the surface 12 inches of soil had greatly increased, especially on the second 6 inches of the taproot. The widely spreading and some of the obliquely penetrating laterals had turned downward and extended well into the second foot of soil. Finally, branching had greatly increased; older branches were somewhat longer and better rebranched and abundant new ones had arisen on the elongating roots. Thus the second and third 6-inch soil levels were rather thoroughly ramified. Mature Plants.--A final study was made July 11. The well-branched vines, which were 40 inches tall, were beginning to dry at the base. The abundant pods bore peas which were half dry and too mature for use as green peas. Fig. 52.--Mature root system of the pea. Note the large soil volume occupied and the greater degree of branching than at the earlier examination (Fig. 51). The pronounced taproots were traced throughout their devious course which was usually characterized by gentle curves but often by abrupt, almost right-angled turns. Depths of 3 to 3.2 feet were found. This, however, was no greater than on June 17. The number of laterals, moreover, had not increased in the surface foot of soil. The lateral spread was a little greater (maximum, 2 feet), more long secondary laterals occurred, and branches of the third order were much more frequent. In addition to the more thorough ramification of the soil already occupied, an extensive new volume of soil had been occupied by the downwardly penetrating main lateral roots. At the June examination the longest of these did not extend beyond the second foot. At this time the entire second foot was thoroughly ramified and much of the third foot was also occupied (Fig. 52). This added greatly to the absorbing area. It is of interest to note that some of these roots extended to greater depths (maximum, 36 inches) than the taproot. Also, their distribution was such that the soil volume below a depth of 1 foot and to 6 inches on all sides of the taproot was almost unoccupied. Whether or not this was ramified later by an elongation of the branches of the taproot was not ascertained. At this time the taproot below the first foot was furnished with relatively short branches. Only rarely did they exceed 4 inches in length and they were frequently 0.5 to 2 inches long. The number was, as before, about five per inch but they had not only grown in length but were also much more profusely rebranched. Branches of the third order occurred on some of the older and longer laterals. This increase in length of branchlets also characterized the larger main branches. Most of the branches of the second order ranged between 0.2 and 3 inches but not infrequently sublaterals 5 to 10 or more inches long occurred. Branchlets of the third order seldom exceeded four per inch in number and ranged from 1 millimeter to 1 inch in length. In the deeper soil, especially secondary branches often took a horizontal course. The roots were rather tough, of a tan color, and in many cases the root ends had dried. Summary.--The garden pea is characterized by a strong taproot which in its early development is profusely branched only in the first 6 inches of soil. Plants about 1.5 months old have a root depth of 2 feet. The surface soil at a depth of 2 to 8 inches is well filled with a network of nearly horizontal roots and their laterals to a distance of 18 inches on all sides of the plant. But in the deeper soil little absorbing area occurs. About a month later, when the plants are blossoming, the root system is much more extensive and efficient. The taproot is 3 feet long and much better branched throughout its entire course, secondary branches are longer and much more numerous, and branches of the third order abundant except on the youngest parts. Lateral spread has been increased to 22 inches. Many of the formerly horizontal roots have turned downward and, with those penetrating more obliquely, fairly well occupied the second foot of soil. Nearly a month later, when the seeds are drying, the taproots have not increased in depth, nor has the number of main laterals increased in the surface soil. But the soil volume earlier delimited is much more thoroughly occupied as a result of an elongation and more profuse branching of the finer laterals. By a downward extension of the main laterals, moreover, the second foot of soil is well filled and the third foot fairly well ramified. Branches from the taproot are profuse but rather short, so that some of the deeper soil area directly beneath the plant is not fully occupied. Thus the pea completes the development of an extensive absorbing system after the beginning of blossoming. Other Investigations on Peas.--The British Queen pea was examined at Geneva, N.Y., when the plants were 4.5 feet tall and the pods just past the marketable stage. Another German investigator found that the pea was very similar to the common bean in its root habit. Like the bean, it formed a clearly defined taproot and then a row of adventitious roots which arose at first from the base of the hypocotyl but later, in considerable numbers, from higher parts of the base of the stem. These roots spread widely. Depths of 28 to over 31 inches were attained.89 In another study it was found that the pea was most profusely branched to a depth of 4 inches and that the largest laterals had a length of 12 inches. The number of laterals of the first order was about six per centimeter of taproot in the upper portion of the root system but only three on the deeper part. Laterals of the second order varied from two to three per centimeter. The deeper portion of the root system was only 52 per cent as well branched as the shallower part. 88 Other European investigators have obtained similar results. Recent experiments with peas at Greeley, Colo., where a dwarf variety (Nott's Excelsior) with a short root system was crossed with a tall variety (Telephone) with a deep root system, indicate that root characters are hereditary and segregate out in the F2 generation according to the Mendelian ratios. A repetition of the experiment under somewhat different conditions of growth confirmed the results, but it was also found that the dwarf variety had almost as long a root system as the taller one. 67 This illustrates the fallacy of judging root extent by top growth. After years of study of scores of native and cultivated plants, it has been fully demonstrated that such a criterion is entirely untrustworthy. A study of these investigations on different varieties of peas supports the conclusion that this species has a somewhat deeply rooting habit of growth. The lateral spread is also similar to that already illustrated (Fig. 52) and branching is quite profuse throughout. Considerable root growth after the time of blossoming was found by most investigators; in some varieties this growth seemed to be chiefly that of the branches, in others an extension of the taproot. Further studies, including adaptation of root system to different kinds of soil, are needed. The Development and Role of Root Tubercles.--Peas and other members of the family of legumes are the most important plants, although not the only ones, that develop nodules or root tubercles. Various strains 96 of a certain motile bacterium (Pseudomonas radicicola) live in the soil. They gain entrance to the root system through the root hairs and push their way back into the cortical tissue of the root where they increase rapidly and occur in great numbers. As a result of their activities, the cells of the cortex of the host make an abnormal growth which results in the well-known enlargements called tubercles. These frequently occur at great depths. On native legumes they have been repeatedly observed at depths of 10 to 13 feet. Although usually most abundant on roots of garden crops in the surface 8 to 16 inches of soil, they are frequently found irregularly distributed over the root system at depths of several feet. All parts of legumes are comparatively rich in proteins and are very valuable as fertilizers. This explains why the practice of growing leguminous crops and plowing them under has such a stimulating effect upon the growth of succeeding crops. On raw soils low in nitrates, such as railway cuts and embankments, where other plants can scarcely grow, certain leguminous plants, such as sweet clover, often thrive. On the other hand, in a soil that is too rich nodule formation is not promoted. Experiments with the development of nodules on field peas and. other legumes have shown that they become much larger when soil temperatures are most favorable. A consistent increase in dry weight of nodules occurred as the soil temperature increased from 12 to about 24°C. At higher temperatures (about 27 to 30°C. for peas) a progressive decrease occurred. 75 Likewise nodule production decreases as soil moisture diminishes below an optimum, or may entirely cease in soils that are very dry. 35, 180, 68 A soil environment favorable to the growth of roots is also favorable to the growth of nodule-forming and many other species of bacteria which promote crop growth. Thus the promotion of proper soil aeration, water content, fertility, and temperature, so far as this is possible, affects plant growth not only directly by promoting root development and activities but also indirectly through its influence upon the activities of bacteria. 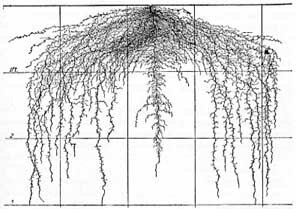 Root Development in Relation to Cultural Practice.--It would seem that plants with vigorously developed and quite extensive root systems like those of the pea would thrive on many kinds of soil. In fact this has been ascertained to be true. Undoubtedly the superficial and deeper portions are modified, respectively, so as best to adapt the plant to a particular environment. Such modifications have been found for beans, the plants of which are closely related and of similar general root habit. For early crops sandy loams are preferred because they are easily warmed. But they do not retain the moisture and are often less fertile than heavier-soil types such as clay and silt loam. The roots need good aeration and the soils must be well drained. If the soil is too rich, the plants will develop large vines and ripening will be delayed. Thorough soil preparation is especially important where the crop is sown so thickly that cultivation is not possible. This is true for a part of the market crops and the canning crop which is sown broadcast or in close drills. Poor seed-bed preparation may result in markedly decreased yields. 64 Otherwise the root habit would indicate that beneficial results will be obtained by frequent but shallow cultivation until the roots thoroughly ramify the soil and the vines cover the ground. Ordinarily peas are spaced so closely that when the plants are only partially developed, the roots thoroughly occupy all of the soil.